One of the benefits of living in an agriculture-based village is being able to follow shifts in diet as the field season and cultural calendars progress. 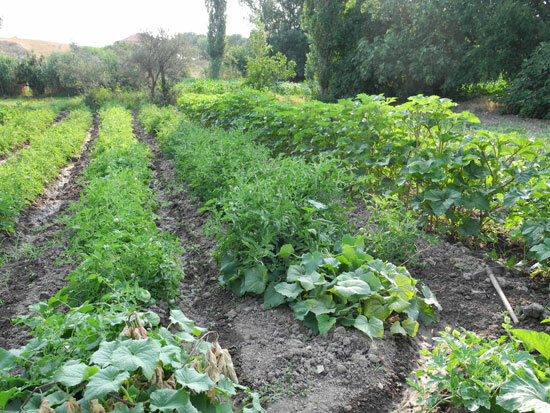 Such shifts remind us to think about how seasonal and cultural factors must always have played roles in ancient cuisines of this region, too. A recent example comes from our daily dessert of fresh fruit. Although we have been eating karpuz (watermelon) and kavun (honeydew) all season long, the colors and flavors have intensified – much to everyone’s delight – as the growing season peaks. 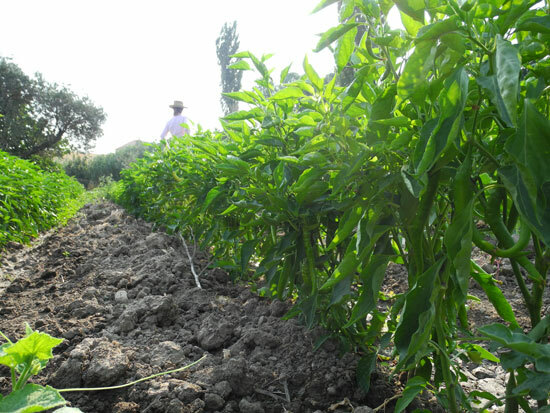 Patlıcan (eggplant), which also grows during the summer, appears in many of our main dishes. Its favorite version so far made an appearance at a recent mangal (bbq) held by the lake. It involved 12 eggplants roasted directly on hot coals until steaming and tender. They were then thrown into plastic bags where their skins were removed before the insides were mashed together with garlic in a bowl. Simple yet delicious, this patlıcan közlemesi (grilled eggplant mash) was the highlight of the meal. 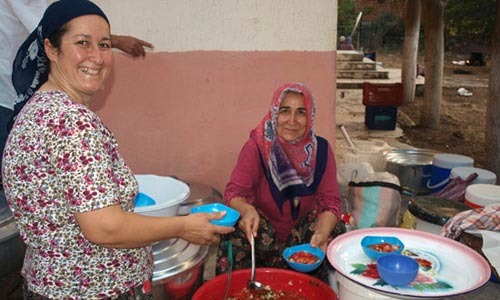 The past few weeks have also introduced first-timers in Turkey to some of the foods related to Ramadan (usually called Ramazan in Turkey), the Islamic holy month that involves fasting during daylight hours. A special product of this month is a traditional flatbread called ramazan pidesi: a disc-shaped loaf with a broad crosshatch pattern on the top, sprinkled with sesame seeds. The dense texture and saltier-than-usual flavor adds to its appeal. The evening iftar (breaking of the fast after sundown) has taken a different form now that we are in the final week of Ramazan. 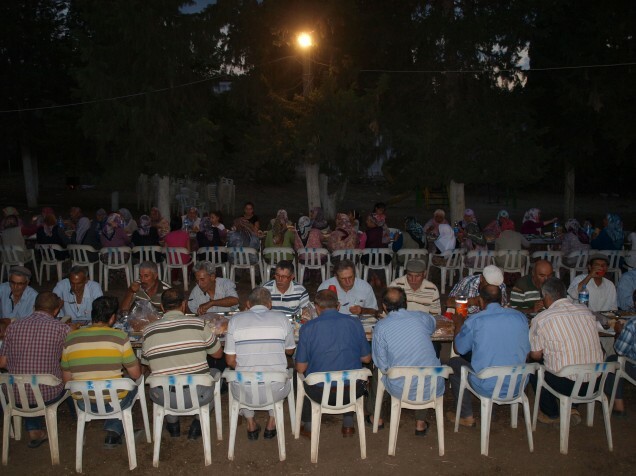 The last two nights saw families in the village host public meals. 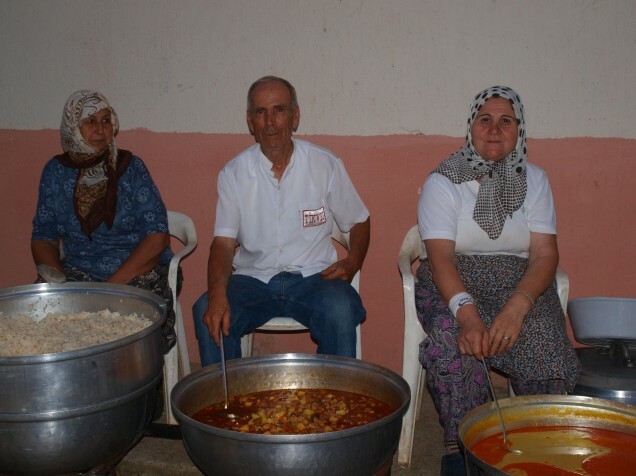 Last night our team’s hosts sponsored the event in the school courtyard, serving çorba (soup), güveç (stew), cacık (a cold cucumber and yogurt soup), pilav (rice), and halva (a semolina-based dessert) to the entire village and their network of family and friends. 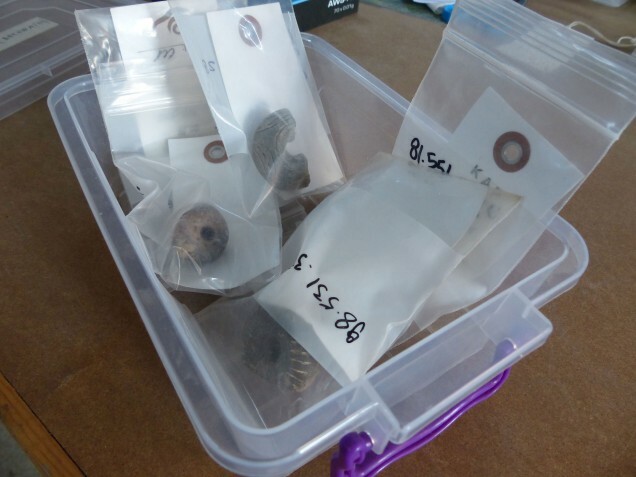 In archaeological lingo, “small finds” are objects like spindle whorls, loom weights, weapons, jewelry, or various kinds of metal tools (and they need not be small!). They can be very important indicators of the intensity and direction of foreign contacts, of social relationships, and of local production both on the household level and in specialized workshops controlled by the elite. Objects found so far at Kaymakçı reflect the residential and industrial character of the area: small metal tools confirm the production of fine objects, while decorated items of bone and bronze reflect elite consumption at the site. Numerous spindle whorls speak to intensive textile production, and their decoration reflects the creativity of the site’s inhabitants. Every day brings surprises and makes the work very exciting. Working with the “small finds” from Kaymakçı is like participating in the making of central western Anatolian culture of the second millennium BCE. As the field season nears its end, our work both in the field and in the lab has begun to pick up speed. 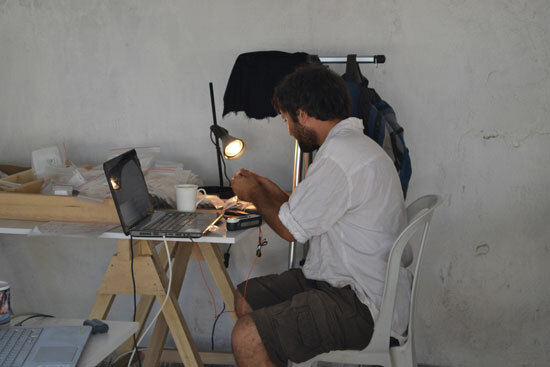 Alongside the large amounts of pottery unearthed at Kaymakçı, here in the lab we are also receiving and processing a significant amount of stone tools, referred to as lithics, that date primarily to the Bronze Age and later. After we photograph and catalogue each piece, we analyze their particular features to understand the type of tool and the use to which they were put. In addition to the lithics, a substantial part of my time has been dedicated to the study of the more recent cultural and economic landscapes of the Marmara Lake basin. 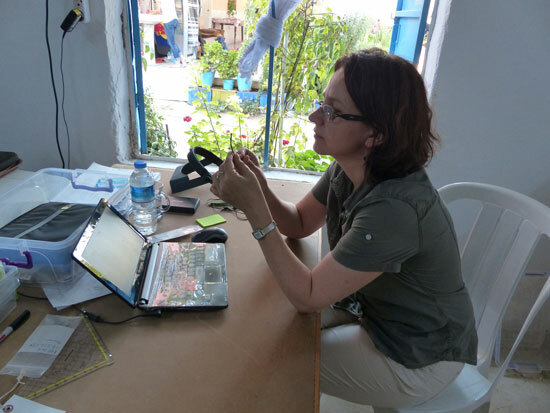 By way of oral histories and visual records collected through long discussions with local elders in Tekelioğlu and surrounding villages, we are tracing the sociocultural impact of economic and technological developments in the Gediz Valley over the last 150 years. Using Omeka Neatline software, we are creating an interactive, diachronic map of the Gediz River valley, allowing viewers to wade through the region’s recent past. These discussions allow us to understand the local effect of the region’s integration into the global scene and provide endless opportunities to drink excessive amounts of çay (tea)! Toward the end of the 2014 season, the conservation staff is busy planning and executing work that will help prevent excavation areas from deteriorating over the next year. This week, conservators placed mortar caps and troughs on certain vulnerable locations along excavated masonry walls. We used a mortar consisting of lime, sand, and small amounts of local soil and cement, which performed well in previous off-site testing. 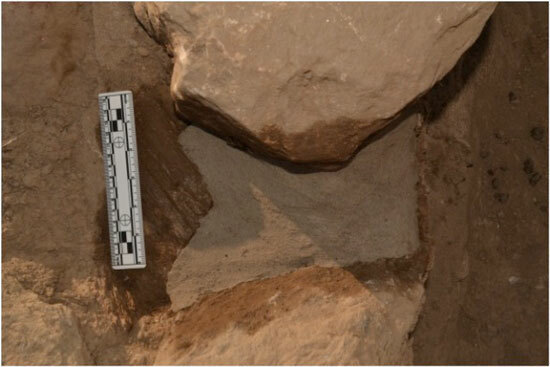 By placing this mortar where we anticipate rain to run down slopes or pool in depressions, we hope to protect recently excavated architectural features from the erosion. In addition to selective mortar capping, conservators are planning the end-of-season excavation area preservation plan, which involves sandbag berms around excavation areas, sandbag buttresses along architectural features, and an overall covering of geotextile. Geotextile is a synthetic, permeable fabric that allows moisture and air to circulate, while reducing potential disturbance and erosion to underlying features. Posted in Community, Conservation, Food, Samples Lab, Voices.